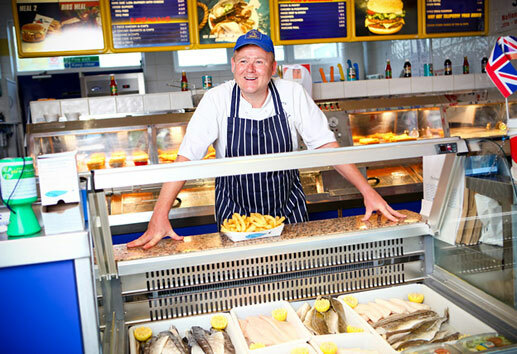 At Henley’s we are committed to offering our customers the very best fish and chips possible in a clean and friendly environment. We are also very conscious of our impact on the environment. We source all our ingredients and materials locally. 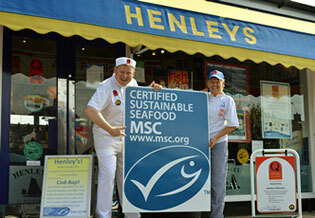 At Henley’s we are convinced once you try us, you will never go elsewhere. 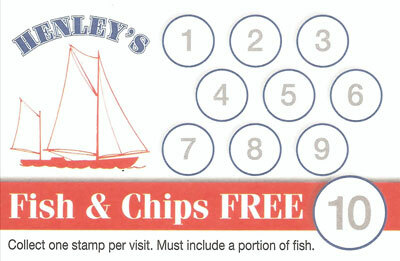 However, we also like to reward our loyal customers with our FREE fish and chips loyalty card. Pick one up in either of our shops. Come and choose your piece of fish from our UNIQUE WET FISH DISPLAY and have it cooked before your eyes! All of our chips are peeled and chipped fresh each morning, all of our fish are trimmed and pin boned (meaning there are no bones)! 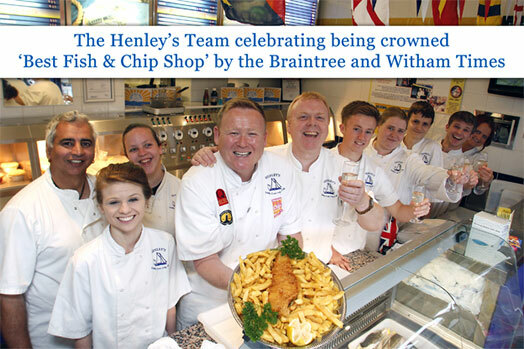 So, come and see us at Henley’s Fish and Chips in Wivenhoe and sample our excellent fish and chips for yourself! Telephone orders are welcome. A wet fish display has been built into the counter/serving area. Our customers can see the different species and the quality of all our fish. Staff are educated and knowledgeable regarding sustainability. This allows our customers to be able to “Buy with confidence”. We believe that training, education & knowledge are vital. Henley’s of Braintree was established in 2009. Our manager at our Wivenhoe shop was John Gibson, who lived in Braintree, and after 7 years of travelling to and from Wivenhoe it was suggested we open a shop in Braintree. John even had a location in mind! Yes, you guessed it, two minutes from his house! The premises were secured, a full refurbishment carried out, exactly, in fact identical, to our shop in Wivenhoe – the same colours, the same frying range, even the exact colour match to all signage and menus. He has done a great job in building the business and we have worked together for over 20 years now. He also has a great assistant Manager, ‘Mac’, and a first rate team!